Nothing you haven't seen before. Just a fishing lead hanging from a rod and a beach. Although this activity is regulated and there are certain hours and areas to fish, walking under a nylon line along the shore is something very common here. I only tried fishing once to find out I am not patient enough and I am more of the diving kind. If you ever went snorkeling, you probably have watched through the goggles at that man on the pier, wasting bait totally unaware of the deserted underwater prairie you have the privilege to explore. 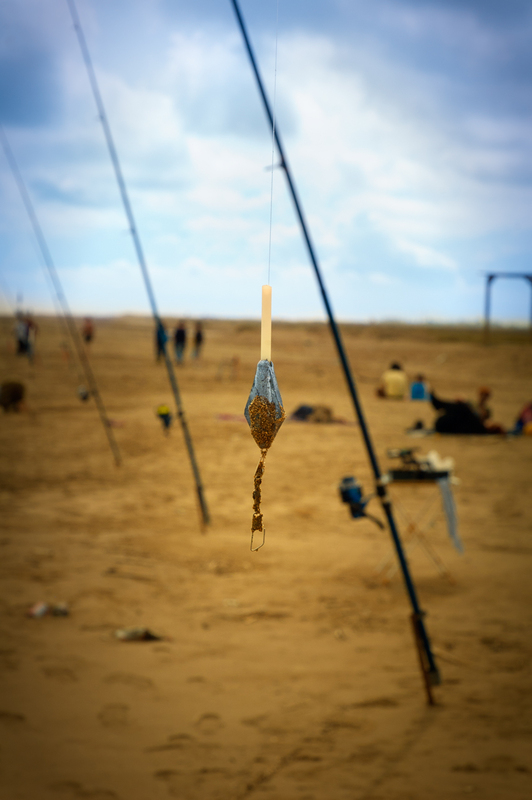 But fishing rods have that certain romantic look, they are part of the landscape, just like fishermen boats are in a painting and they meet their purpose which is, triggering a hypnotic status in the mind of the fisher-to-be. Maybe the most interesting thing here is the location, a wonderful natural park with wild beaches called Delta de l'Ebre, in the province of Tarragona, Catalonia. Towns nearby are popular among other things for the fantastic paellas, smoked eel tapas, frog legs, angulas (young eels), etc. In the stillness of a warm summer day, it is there to quietly catch a rambling thought. I love the photo and especially your reflective comments.